Für Ihre Bequemlichkeit hat Waschmaschine und Trockner in der Einheit hinzugefügt. Es gibt einen 24-Stunden-Sicherheitsdienst, Whirlpools (innen und außen), zwei Babybecken, zwei große Pools, Tiki-Bar, Austernbar, Shuffleboard, Grillmöglichkeiten und Picknickplatz, Friseursalon, Snackbar / Laden, Spielhalle und vieles mehr. viel mehr. The apartment is fine and every thing was there that we needed.there was only one remote for two tv,we took our own kettle and toaster.the view of the sea was great.But the apartment was dirty,it took us two days to clean the apartment,cubboards had mold and the toilet backs up,if you flush twice you can use it.We enjoyed our stay,the pool was not ready until the end of our stay which was disappointing.lighted cigarettes were dropped from apartments above us on to our balcony. The view was great,the location was perfect,the apartment lay out was good no problem with parking,But the apartment was dirty,requires decorating painting and small repairs,furniture needs steam cleaning,sink and a few floor tiles cracked,door frame cracked,toilet backs up,you have to keep plunging the toilet.we are on the second floor,lighted cigarettes are being flicked from above on to our balcony.we did not expected a new apartment but all this can be fixed easily. The entire condo was filthy. I'm sure the blind house cleaner works hard but this was ridiculous. Stuff all over the floor. Sheets had stains on them that had to be washed immediately. One blanket folded on the bunk beds had Gummie Bears stuck to it when it was unfolded. The toilet was stopped up and maintenance had to be called. He was very responsive and quite capable, the best part of this stay. Couch and chairs have stains, the chairs around the table are breaking down. We would have been better off to stay in our truck. Avoid this mess. I would give zero stars if that option were available. Best location, on the Summit property!! This very clean, and colorful condo, delivered more than expected! From the comfortable furnishings, to the plentiful linens, we found it easy, to make ourselves at home. On the 2nd floor, just to the right of the stairs, we couldn't have asked for a better location. We had practically all of the ease, as those staying on the first floor, but with a balcony and perfect view! We were at The Summit, on a trip with extended family, who rented from various owners, and none of them experienced the prompt response, that we received, when a question arose, during our stay. 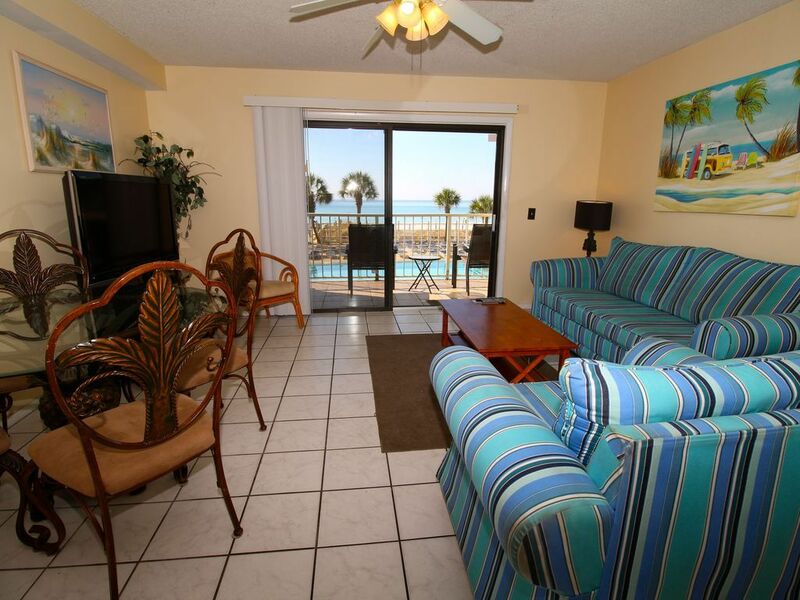 I would highly recommend Emerald Coast Destinations, to anyone looking for a nice condo, and friendly staff, to help them through the reservation process, and throughout their vacation. A Plus experience! Pros: 2nd floor walkup, memory foam topper on mattress, new shower unit. Cons: Looks like the owner does not visit. Broken: Kitchen sink has a huge crack, faucet sprayer cover, drawers below bunks, fridge shelves, metal dining chair. Missing: shelves in fridge door, finials to lampshades in den, den tv/dvd remote. Disappointed: no mounted hairdryer, old bedspread needs replacing, no beach service provided by this unit. Maid was not thorough - I found a used cup in the vanity and broken glass in the dishwasher. Dishwasher had not been emptied prior to my arrival and found prior tenant's medication in the hallway floor. Still had a nice time. Have stayed at Summit many years and will again, but probably not this unit. If you are looking for a five star unit, this is not it. If you are looking for a decent unit at a great price, this unit is for you. I would strongly suggest you keep a close watch on your belongings, I had a pair of Costa sunglasses stolen. I would consider this unit if I am ever back in PCB, but would definitely keep a closer watch on my belongings. Although I have no proof, I am confident it was one of the Summit's employees who swiped my glasses. I did not figure it out until I had already checked out!